The Tamil Heritage Foundation is a global initiative started by heritage and language enthusiasts living abroad to preserve Tamil Heritage in digital media. Most of THF’s ground activity happens in Germany, India, UK and South Korea. It is registered under the Society Act in Chennai but has a worldwide membership. Dr. K. Subashini Kanagasundaram, a Malaysian born Tamil, living in Leonberg, Germany, an IT architect in a leading international IT Company, is President and co-founder of THF with Dr. N. Kannan from Malaysia (earlier Korea and Germany). In order to e-preserve Tamil Heritage material in England, THF London has photocopied several Tamil books in the India Office Library and digitised them for public study. Researchers make considerable use of all these works. The digital version is fully downloadable as PDF files at the THF site. 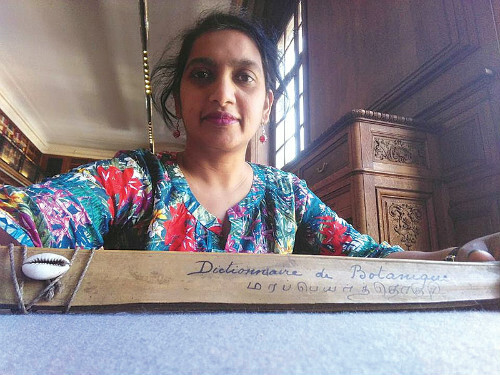 Subashini in search of more materials available outside India in Tamil, recently visited the Bibliothèque Nationale de France, the National Library of France, in Paris. This library’s extraordinary collection includes 578 Tamil manuscripts both in palm leaf and paper form and images from Tamil Nadu. Some of them are already digitised and available on the Net; the rest are stored in palm leaf and paper manuscript form, others in microfilm form. Like the British Museum Library, this library too has collections of manuscripts and books from India, especially Tamil Nadu, mostly accumulated by Christian missionaries. In Paris, Subashini has successfully digitised selected rare manuscripts like Thiruvalluvar Kural, Tanmandiri udar kuru, Samuttirigapalapalan, Mariyamman Paadalkal, Sittirakadaegal and C.J. Beschi’s Grammatica Latino-Tamulica. Beschi (1680-1742), an Italian Jesuit priest like his predecessor de Nobili, learned Tamil, composed a lexicon, Chaturaharathi, and wrote several books. His grammar book was written c. 1738. 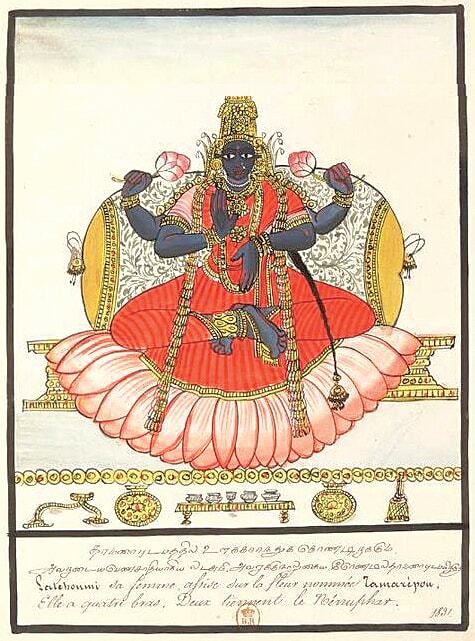 He is known in Tamil Nadu as Veeramamunivar and is the author of the well-known Paramartha Guruvin Kathaigal. தாமரை புட்பத்தில் உட்கார்ந்து கொண்டிருக்கும் அவரது பெண்சாதியான லட்சுமி அவளுக்கு நாலு கை.. ரெண்டில் தாமரை புஷ்பமுள்ளது.? The Jesuit missionaries started learning Tamil once they arrived in Tamil Nadu in the 16th Century so that they could propagate the religion. Language was necessary for proselytisation and some of them, like Father Henriques, mastered the language and produced books of Tamil grammar. All these works are now preserved in libraries abroad. Among other books Subashini found in Paris was Castes et professionsde l’Inde, a book with hundreds of illustrations depicting the professions of people in Tamilzhagam in the early 19th Century. The hand-drawn illustrations show the occupation of a man and his wife based on their caste. This book, by Philippe Etienne Ducler (1778-1840), Administrateur at Karaikal in 1830, is something like that classic, Castes and Tribes of Southern India by Madras-based Edgar Thurston, assisted by Rangachari. Another important work is Divinités et souverains de l’Inde, a book with illustrations of Hindu deities, sculptures and some temples. Handwritten notes both in Tamil and French describe each deity. 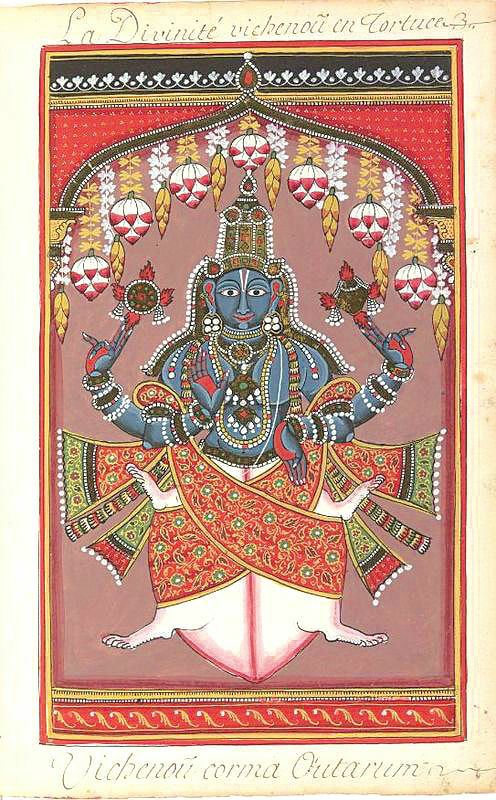 Another book that attracts the attention is Coloriées de Divinités Hindoues containing 142 figures of various Hindu deities, with names written in Roman letters and descriptions provided in French. The illustrations are brilliant. Subashini says that there are, in the Paris library, a rich treasure of manuscripts awaiting researchers. One of the major undertakings by Dr. Subashini! It requires tons of hours of dedication to do such work! Both the Government and other Tamil enthusiasts MUST support her in whatever ways they can. God bless her with a long life of health and prosperity! Her Dedication in unimaginable.., The Tamil Literary Society has to admire., and appreciate her works.., Sometimes without caring her health., she is continuing her works.., ie., the worrying factor..
” KUDOS TO HER., WE HAVE NO WORDS TO THANK HER.., SALUTATIONS…!! சகோதரியின் பணிகளைப் பாரட்ட வார்த்தைகள் கிட்டுவது அரிதே.., அரும்பணி ஆற்றும் அன்புச் சகோதரி., உடல் நலத்திலும் கவனம் செலுத்த வேண்டும் என்பதே எங்கள் அவா. இயற்கை அருளால், சகோதரி அவர்கள் நீண்ட ஆயுளோடும், நிறைந்த நலத்தோடும் நெடு நாள் வாழ வேண்டும். சிரந்தாழ்ந்த நன்றி..!! வளர்க தமிழ்.